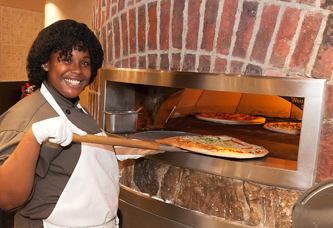 Our pizza dough is made fresh, from scratch, every day. Our soups and sauces are made from scratch, using fresh stock. All of our entrée meats are roasted in house. Our burgers are hand-pressed and made with fresh, never frozen, ground beef. Our fried entrées are always hand-breaded. Cookies and muffins are baked fresh daily right here in our kitchens. Fresh-cut French fries, using locally-grown potatoes when available, are offered at our grill daily. Our menus emphasize fresh fruits and vegetables, sourced locally when in season. Our scratch cooking methods focus on fresh, non-processed ingredients. On the plate, that means incredibly flavorful and more nutritious meals. Food is prepared to order, or cooked in small batches as close to service as possible. 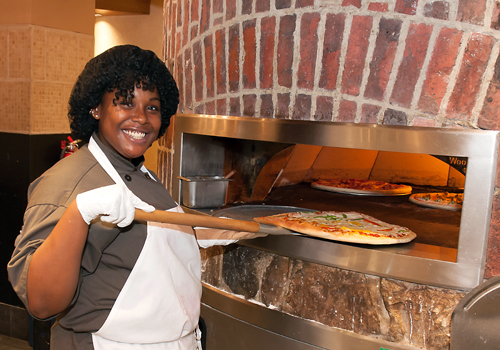 We’ll be serving up fresh, organic, cage-free shelled eggs daily, pizza dough that is made fresh from scratch, fried entrées that are hand-breaded (and not from a package) and cookies and muffins baked fresh in our kitchens every day! Our menus emphasize fresh vegetables, fruits, legumes and whole grains. Soups and sauces are made from scratch with fresh stock, which means richer flavor and less sodium in your diet. We use only trans fat-free canola oil and offer vegetarian options at every meal. Whether you’re looking to power up for a big game or for some brain food to boost your concentration for exams, we’ll have nutritious, health-focused options ready for you. We love local! At least 20% of the food purchased for your dining program will be sourced locally. That means it’s seasonal and fresh and it supports local farmers and artisan producers, as well as being good to the environment by cutting down on pollution from transportation. Check out our blog for our latest adventures with local, seasonal and sustainable foods.